Wired headsets using a 3.5 mm stereo jack will will go the way of dinosaurs sooner than later. The trend seems clearly in the direction of Bluetooth,Lightning, or new Type USB-C port configurations. That doesn’t mean we should ignore the venerable wired headsets. The older technology has improved remarkably and you can still listen to all your tunes with high quality audio for a relatively modest amount of money. There will also be a life raft for the older 3.5mm ports in a variety of relatively inexpensive adapters. 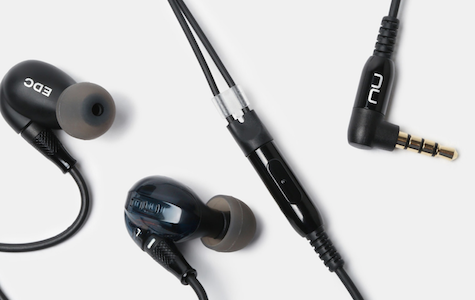 The NuForce EDC (Everyday Carry) In-Ear monitors make a strong case for sticking with the tried and true. The audio is above average sound quality for a headset in this price range. The mid and high range performance are resonant and clear, but if you’re looking for bass that will rock your car’s suspension system, look elsewhere. The NuForce bass is adequate but neither deep nor aggressive. The headset comes with two interchangeable cables, one braided and one flat. The flat one has inline controls and some people may find the braided style to be very cool. The monitors themselves are very comfortable — no surprise considering they were designed in the shape of the ear. Wrap the cable around your ear from back to front, gently press the monitors into your ears, and they’ll remain snug and comfortable. 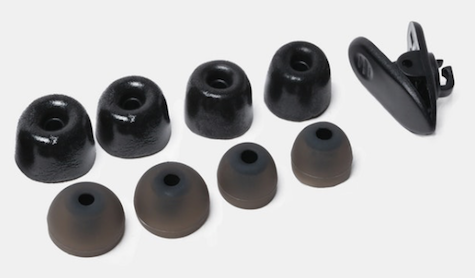 An attractive carrying case is provided along with different sized tips for the in-ear speakers. The Nuforce EDC (Everyday Carry) In-Ear monitors are a good value and will likely satisfy the average user.